He is as gentle as they come! weekend prior to his OFFF double Best of Show win! All at age 9. ﻿When the opportunity lent itself to getting Marisco from Kay in July of 2002, Jeff and I jumped on it! Like many llama owners, I have always loved the *El Fuerte bloodline. Over the years his offspring have won more than any other male's offspring in the showring, including ALSA National Get of Sire in 1999. Marisco's dam is an *El Fuerte daughter out of a full Peruvian import female named *Mariacha. Mariela is an ALSA Produce of Dam Champion & ROM. Marisco's sire is the 2001 & 2010 ALSA National Grand Champion Medium Wool Male, *Sipan﻿. He holds his ROM's in Halter & Get of Sire and is a Halter Champion & Get of Sire Champion in ALSA. Marisco was used by Hinterland to help *Sipan and Mariela win their titles. Offspring from *Sipan have consistently cleaned up in their halter classes and have won the 2003 National Reserve Grand Medium Wool Male, 2006 National Grand Champion Heavy Wool Female title & 2008 National Grand Champion Medium Wool Female title. To our knowledge he is the ONLY import male to ever win Nationals twice in halter and produce three offspring that also have won. Nearly everyone in Marisco's pedigree is an ALSA Halter Champion. His lines make him a no brainer for producing champions also. Marisco's offspring and grandoffspring are already winning in the showring. He has a wonderful and willing disposition, making him the perfect therapy llama. He has been to nursing homes, collected food for the homeless and much more. Marisco is very laid back llama! He received a PERFECT score on his Delta Society Pet Therapy (now called Pet Partners) testing all four times, making him one of the few therapy animals in the country with a "Complex" registration. Marisco continues to win Grands and Best of Shows in halter for our farm. His offspring and grandoffspring are also winning all over the country for other farms. We usually only have 1-2 babies available by him a year. They always sell right away! Marisco has been a heck of a producer for our farm. He turns out champions for us every year. When paired with the Eagle daughters he makes magic too! He is about as correct as they come and stamps his bone, conformation, ears, fine fiber and temperament on his offspring. This male is very pre-potent! To our knowledge, Marisco is the woolliest and best producing *Sipan son in the country! Marisco's full brother "Mariell" resided in Wayne Rankin's program, but is now deceased. 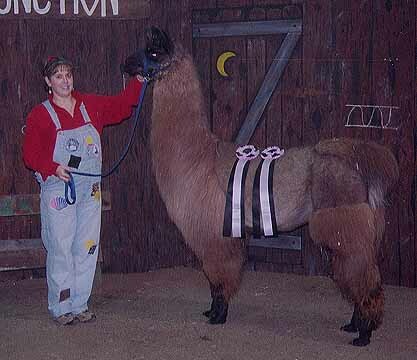 Kay had shown him and he was an ALSA Halter Champion and had his ALSA Halter ROM. Mariell was also the 2003 ALSA National Reserve Grand Champion Medium Wool Male. 10/5/02 Northwest Llama Classic (ALSA), Monroe Wa. Grand Medium Wool Male & won two 1st places. JNK Marisco's Venicia, JNK Marisco's Rustamone & Serenity Park's Ramazon were all Grand Champions in Halter under both judges. Ramazon was Double Best of Show Male. JNK Marisco's Ducati was Reserve Grand Champion in Halter under both judges. JNK Marisco's Katastrophe was Grand Champion Single w/Crimp. Fleece On. There were performance wins too! Marisco was the sire of both the first and second place, but the first place was under the dam CMF Eagle's Kestrel. *Son JNK Marisco's Murano was Double Reserve Grand Silky Wool Males, Grand Champion Single w/ Crimp Bagged Fleece and Overall Reserve Versatility Champion. *Son JNK Marisco's Lucchese was Reserve Grand Light/Medium Wool Male. *Daughter JNK Marisco's Venicia was Double 1st place Adult Heavy Wool Female. 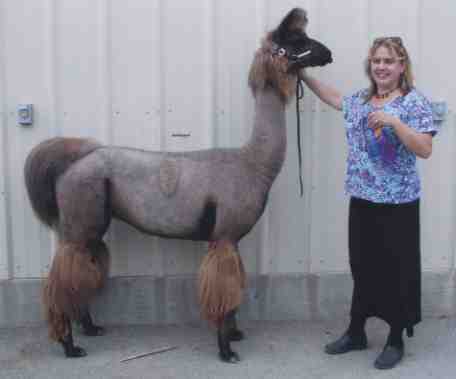 *Son JNK Marisco's Rialto was Double Grand Silky Wool Males and Reserve Grand Champion Single w/ Crimp Bagged Fleece. All at 5.5 months old.